Developed following Bradford Networks’ technology alliance with Fortinet, this customized version of Network Sentry/RTR correlates high fidelity security alerts from the Fortinet High Performance Network Security Platform to contain advanced cyber threats on compromised endpoints in seconds. By automating the complex threat triage and response process, Network Sentry/RTR for Forinet minimizes the risk to assets and intellectual property, protects the brand, and reduces the impact, time, and cost resulting from cyber threats. 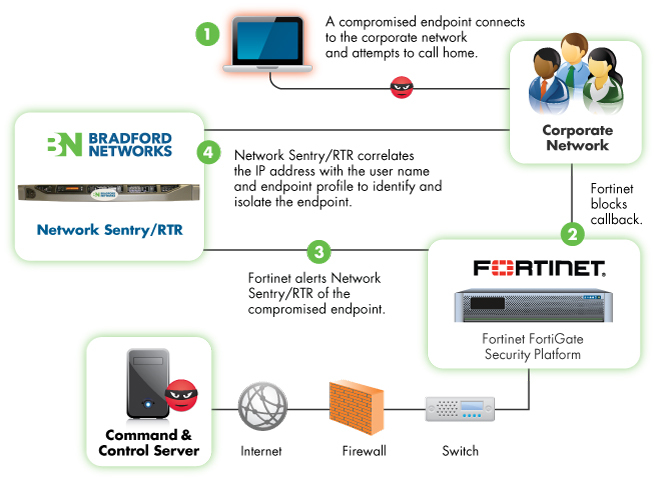 Download the Bradford Networks' Network Sentry/RTR for Fortinet Solution Brief (PDF).